In this VETgirl lecture, Dr. Justine Lee, DACVECC, DABT reviewed some helpful hints on how to survive clinics! This veterinary continuing education webinar reviewed helpful hints such as "The BIG 4" (PCV/TS/BG/AZO), how to interpret venous blood gases in 3 minutes or less, how to care for your patients well, and how to make the most out of this important year! Note: This is a FREE webinar and has no RACE-CE approval, as it is focused for veterinary students! Are you a veterinary student? Click HERE for instructions on how to become a FREE VETgirl ELITE Member! 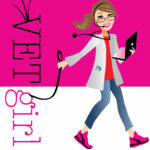 Veterinary students have FREE VETgirl ELITE access – information HERE! derp, didn’t realize I was posting onto a public forum. Thank you!! !